Beat eggs with sugar and ovalette until white and fluffy. Mix the coconut milk, pandan juice/paste, green colour and salt in a cup. Mix the baking powder with the flour. Add the coconut milk and flour alternatively into the egg mixture and mix well. Spoon mixture into prepared mould and steam on big fire for 10 mins. Steam shredded coconut for about 5 to 8 mins. After steaming, add in salt and tapioca/corn flour and mix well. Place some steamed coconut into the base of a mould. Use another mould to place on top of the mould with coconut and press hard on it. Do the same for all the mould. Your foods look good , in this receipe ,can I ask what is ovalette? thanks for reply ! Ovalette is actually a spongecake stabilizer. You can use any spongecake stabilizer. where do you buy your mould?? I bought my moulds many years back I cannot remember. But I know in Singapore, Phoon Huat sells it. I love your blog....I am busy mom with 2 kid too and i love baking. Would you please help me to buy ovalette. i live in the US, Houston, Texas. any web site form Singapore or Malaixia sell it. Do you have phoohuat web site that selling OVALETTE? Thank you very much for your help and waiting for your answer. 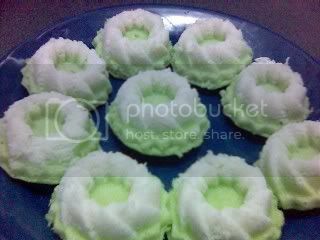 hi BM...this 'baby pandan chiffon cake' is actually known as Kuih Sri Ayu! Where can I buy ovalette? Quinn, very nice dual colour chiffon cake. Very nice presentation too. Hi sq03081, you can get ovalette from NTUC, Cold Storage or any bakery stores. Here if Phoon Huat's website http://www.phoonhuat.com/. You can see which store is nearest to you.